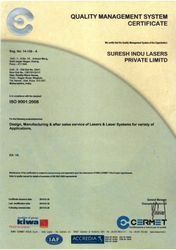 Suresh Indu Lasers is a quality-conscious company that is reckoned due to the optimum quality products that are manufactured and supplied to the clients. Our experts make use of the advanced Quality Management System that ensures our clients a supreme variety of welding machines. We believe in the constant development of the products in combination with innovative designs that is necessary for meeting the requirement of the clientele. Our entire range of services & products undergoes quality evaluation with the help of our sophisticated testing amenities where our quality management personnel monitor the fabrication of flawless components. The entire collection is manufactured as per the existing industrial norms and is, therefore, excellent.